Some years ago, Tamiya released a 1/48 scale model of the ubiquitous Citroën 11CV “Traction Avant” which was followed shortly after by an up-scaled and more detailed 1/35 scale kit. Now SKP Model bring us a set of replacement wheels. The Traction Avant was produced for over 20 years from 1934 to 1957. It was one of the first cars to have front wheel drive (French: “traction avant”), which gave it great characteristics on the road and was so novel, that the car was usually simply called “Traction Avant”. It was used by the French Army and later also adopted by the German Army. Many still survive today in collections around the world. The set consists simply of the four wheels to replace the kit’s wheels. They are of a different type than the Tamiya wheels, both narrower and with a different rim type. There are several rim types evident from photos. I assume that the wheels provided in the Tamiya kit are a more sturdy military type, while the replacement wheels are of a more delicate civilian type. There are two types of similar design evident from photos, one with long lightening holes along the edge and the other without. The replacement wheels are of the latter type. They conform well to pictures of the originals and seem to be the more common type of wheels for the civilian version, especially with regard to the width. The wheels have nice detail, from the embossing on the tire to the delicate tire pattern. The resin sprue is easily removed and of course somewhat compromises the detail in that section of the tire pattern. This is however no problem as you will just have to make sure that part is on the side of the wheel touching the road. There is no bulging to simulate the weight on the wheel, and I don’t know if this can be changed with resin wheels. Maybe someone can recount his experiences with this? Construction is very straightforward, with the wheels simply replacing the kit wheels and sliding over the axle. No construction is needed, and the fit to the kit axle is perfect. There is no provision for the wheels to turn (such as the poly cap in the kit wheels), however, the axle is not fixed and the wheels can be turned for ease of painting. A simple, yet effective, update. Highly recommended! AFAIK, the Traction-Avant could be fitted with 3 types of wheel rims at the factory : 1) the rim called "Stop" : it was the original rim (it's the one replicated by SKP) which had a chromed hub cap. 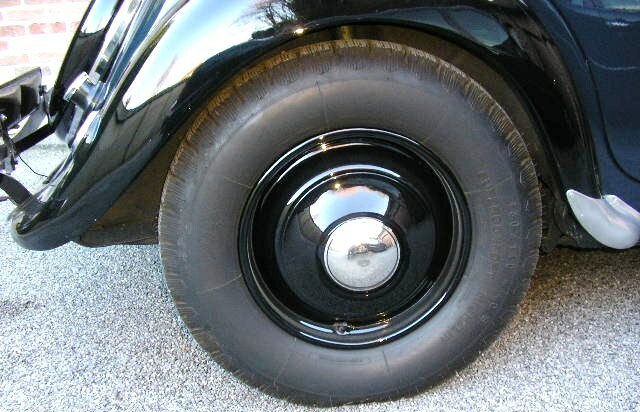 2) the "Pilote" rim : it appeared in 1937. It was lighter than the Stop but much more fragile... 3) the "BM" rim (=Brevet Michelin) that ressembled the "Stop" is a postwar type (1947). Of course, the TA could be fitted with AM rims as well... HTH H.P. Hi Arthur I guess this is the picture you're talking about The pictured model (the 4-wheel one...) is a restored 1936 7 CV Traction-Avant fitted with "Pilote" wheels which appeared in october 1937). Those are indeed the ones in Tamiya kit, but they were more fragile than the earlier "Stop" wheels pictured below : H.P. Dang, Frenchy--You are one heck of a repository of knowledge. Guess when the French found the Germans were going to take all their TA's for staff cars, they quickly installed the weaker wheels, and put the stronger ones away for after the war! !